Spring is in the air, and along with milder temperatures and fresh blooms, pet parents should be aware that some of the season’s new growth may also be poisonous for their pets. 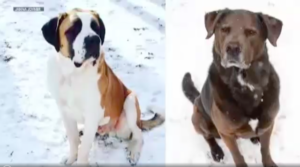 In Wake County, North Carolina, a dog mom of six is mourning the tragic loss of two of her pups after they all ingested poisonous mushrooms from her yard. Janna Joyner, who works at a nonprofit group that fosters dogs, came home to find four of her dogs stumbling and vomiting, and two of them already dead. Joyner’s Saint Bernard, named Draco, was almost 3, and Adoni, a Lab/Retriever mix, was 8-years-old when the poison took their lives. According to David Dorman, a toxicology professor at NC State University’s College of Veterinary Medicine in a story by WISTV, the pups could’ve ingested the plants hours before the symptoms surfacing. He also noted that some mushrooms cause liver failure, and have no antidote. “So a dog that consumes those mushrooms can go from health to very clinically sick to dead within 24 to 48 hours. It’s a very rapid disease syndrome,” he said in the story. Dorman says that poisonous mushrooms come in all shapes, sizes, and colors, so it can be nearly impossible to know which ones are toxic and which ones aren’t. He suggests that if there are any mushrooms in your yard, it’s best to err on the side of caution. “It’s always best to just cut them, bag them and throw them away. And after you’ve handled the mushrooms, wash your hands yourself so you don’t get exposed,” he told WISTV. We are so sorry for this family’s loss and hope that it serves as a reminder to pet parents to be careful of potentially toxic plants as the weather warms up. Scan your yard, garden, and any parks or trails you visit with your pooch for mushrooms, and make sure your pets stay far away.